Aerial Silks: No experience needed. Learn the fundamentals of aerial silks and have fun while doing it. 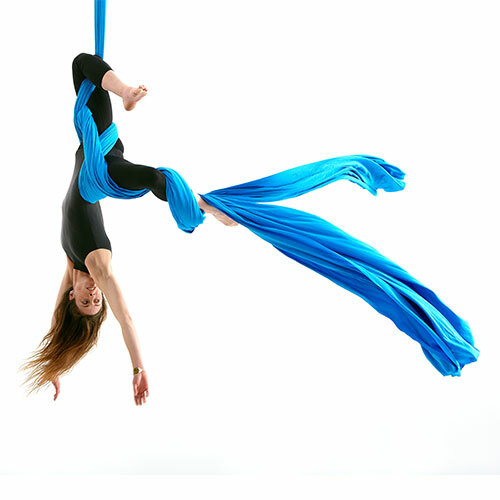 This class is an introduction into the world of Aerial Dance. This apparatus consists of two pieces of fabric that are suspended from the ceiling. Students of all levels of physical ability may take this class. The class will focus on your progressive development on the aerial silks while increasing your core strength and flexibility. Students participating in class will come from a wide variety of backgrounds from a beginner to an intermediate level. Students new to the activity will learn the fundamentals of the aerial arts, while intermediate students will continue to increase their skills, tricks and techniques combinations. We will work on developing strength, flexibility and coordination, as well as exploring the creative element of aerial dance. Junior Aerialist: This is an Intro to Aerial class for ages 10-17. Email: TripleThreatAerialSilks@gmail.com to schedule Private/Semi-Private lessons with Candace or Sonja.